If I had to choose, I'd say that potatoes are my favourite vegetable, they are affordable, versatile and bet you didn't know they are full of nutrients and minerals like potassium, vitamin c, fibre, B6 and iron. Well, you probably did know all this, but just in case. This potato salad recipe I'm about to share with you is from Ferran Adrià's The Family Meal cookbook. This recipe calls for new potatoes, but I'm using Yukon Gold potatoes instead. You could also skip the frankfurter to make it vegetarian, but, I highly recommend not to substitute any other ingredient, especially when it comes to the mustard, mayonnaise and cream mix, as this is what makes this recipe especial. Cook the potatoes in salted boiling water for 20 minutes. 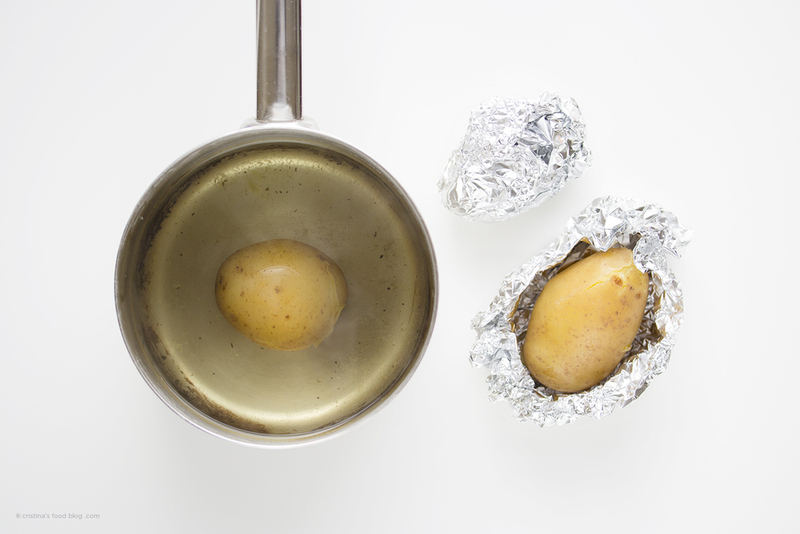 Drain and wrap individually in aluminium foil and let them rest for an extra 20 minutes. This method will make them easier to peel and will keep them warm. Cut the frankfurter and gherkins into 1/2 cm slices. Finely chop the spring onion and chives. In a small bowl, whisk together the mustard, mayonnaise and double cream. Unwrap the now warm potatoes and using a spoon or your fingers, peel off the skin. Chop the potatoes into 3cm cubes. In a medium size bowl, add the potato cubes along with the spring onion, frankfurter, gherkins, and the mustard mix, fold everything gently until well combined. Sprinkle with the chives before serving.